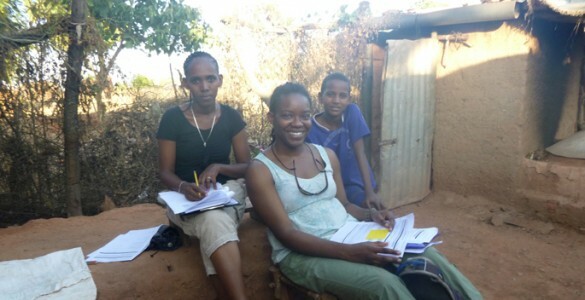 Former Vanderbilt resident Rachel Idowu, M.D., MPH, center, traveled to Africa last summer as part of the Centers for Disease Control and Prevention’s response to the Ebola outbreak. Rachel Idowu, M.D., MPH, spent five weeks in Africa last summer assisting the Ebola outbreak response in Monrovia, Liberia’s capital and most populous city. After residency training at Vanderbilt in General Surgery, Idowu received a Vanderbilt Master of Public Health degree in 2014 and now has a global health post with the Centers for Disease Control and Prevention (CDC). When Idowu traveled to Monrovia last August for the CDC’s Division of Global Health Protection, she had already worked extensively in Africa. She arrived in a country still in recovery from the Second Liberian Civil War, which ended in 2003. She worked with county health officials to improve data flow, the coordination of teams sent out to find cases and the effectiveness of teams taking suspect cases to isolation facilities. She also worked with the Liberia National Dispatch Center, essentially the “911” for the entire country. During the prior two years, Idowu had undertaken on-the-job training with the CDC’s Epidemic Intelligence Service, where she was assigned to the Emergency Response and Recovery Branch, which provides humanitarian assistance amidst natural disasters, war and famine. “The distinction between an Ebola epidemic and a typhoon or earthquake is considerable, but whenever you have a huge swath of your population that’s impacted all at once by a problem, some of the same problems arise. “The work that we do as epidemiologists, despite the particular context, is essentially to describe the who-what-when-where-why of disease: who’s getting it, why, what are their risk factors, what seems to characterize their illness when they get it. And generally all those questions are asked with the thought of how do we prevent it whenever possible,” Idowu said. She describes her current role for the CDC as helping countries with limited financial resources organize and restructure their public health systems. Since returning from Liberia in September, she has traveled to advise health authorities in Ghana and Zambia, and has visited Ethiopia twice to assist African Union planning for a continent-wide public health authority along the lines of the CDC. Asked what she least likes about working in global health, Idowu said her patience is sometimes tested by limitations in resources and infrastructure that can slow the response to crises. The frustrations of the job are far outweighed by the rewards, she says. “Honestly, I love interacting with people who are very motivated to make their country better. “I had a very strong inkling, probably from my second or third year in college, that I wanted to work on systems, to work at the level of a government or national organization that has responsibility for policy and setting guidelines for how health care gets conducted.